Incredible pictures showing 16 inches of snow across a town in the Sahara display a side to the desert few have seen before. 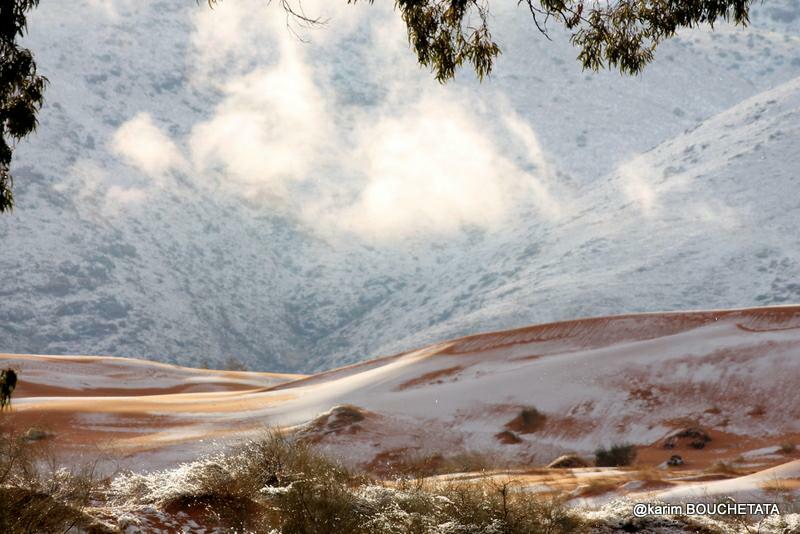 This snow storm is the third time in 37 years the town of Ain Sefra in Algeria has been covered in snow. Snow started falling in the early hours of Sunday morning and began to settle on the sand when photographer Karim Bouchetata quickly snapped the beautiful pictures. While the town only saw an inch or two of snow, the sand dunes themselves were covered in the icy blanket. The snow appeared at 00:00 in the desert gate of the city of Ain Sefra, but it did not last very long. There was no trace of it in the city. The view was wonderful. Snow white on the golden dunes and mountains of the area. The town, known as ‘The Gateway To The Desert’, saw deep snow in 2016, causing chaos in the local region, with passengers stranded on buses thanks to icy roads. They saw a repeat flurry of snow in January 2017, so much so that children made snowmen and even sledged down the sand dunes. Prior to those downfalls, the last time snow was seen in the region was February 18 1979, when the snow lasted just half an hour. Cold air was pulled down south in to North Africa over the weekend as a result of high pressure over Europe. The high pressure meant the cold weather extended further south than normal. It is incredibly rare to see such low temperatures in the town, as it is normally six to 12 degrees in January. These photos, while beautiful, also serve as a stark reminder of the changing nature of the world’s climate and the impact that has on the environment.